Posted October 13, 2017 by laurielmorrison & filed under Author Interviews, Middle Grade Literature, The Writing Process. You know that feeling when you’re reading a really good book, and you’re so desperate to know what’s going to happen that you hurry through the pages even though you also don’t want the story to be over? That’s how I felt with Jen Petro-Roy’s middle-grade debut, P.S. I Miss You. The book is written as a series of letters from the charming and earnest Evie to her older sister Cilla, and the intimacy of that epistolary format contributed to making the book so impossible for me to put down. I’m a sucker for a good epistolary novel…but I also recognize the challenges a writer encounters when structuring a novel as a series of letters, diary entries, or messages of another kind. 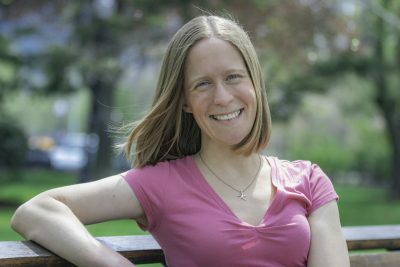 Since Jen rocked the format, I was eager to interview her in this second installment of my “Why Epistolary?” series. If you missed the first installment with A.B. Rutledge, definitely check that one out, too. But for now, meet Jen! Jen Petro-Roy is a former teen librarian, an obsessive reader, and a trivia fanatic. She lives with her husband and two young daughters in Massachusetts. It’s definitely heartfelt. And heartbreaking and heartwarming, too. Here’s what Jen had to say when I asked her about the format she chose! Laurie: Why did you choose to write the novel as a series of letters from Evie to Cilla? Jen: I’ve always loved epistolary novels–there’s something about the format that cuts straight to the heart of what the protagonist is thinking and feeling. In journals, texts, and letters, there’s no intermediary, no narrator to bring focus away from the thoughts and feelings that are so deeply held. I’ve played around with ideas before, but I didn’t get inspired for P.S. I Miss You until I re-read a book by one of my favorite childhood authors: Dear Mr. Henshaw, by Beverly Cleary. I was amazed at how much Cleary conveyed in those letters, and my protagonist, Evie, and her journey toward self-discovery and negotiating family relationships, sprung from that form. Laurie: You’re so right about the way the format gives the reader such intense, direct access to a protagonist’s thoughts and feelings. And I re-read Dear Mr. Henshaw as an adult, too, and I agree that we learn so much from those letters in a way that feels natural rather than clunky. That’s something you managed to pull off with Evie, as well. What do you think the specific epistolary format enabled you to do that you might not have been able to do otherwise? Jen: As I mentioned, epistolary novels–in my book’s case, letters specifically–let you dive inside the mind of the letter writer. In her letters to her older sister, Cilla, Evie is honest about how she feels about Cilla’s pregnancy and the deep religious beliefs of her parents. Without that face-to-face interaction, letter writing lets Evie express more of her emotion, because there’s no face-to-face judgment, something that is a huge concern to her family otherwise. I love how the format let me play with varying chapter lengths, use cross-outs, and play with time, too. Laurie: I love that the letters to Cilla end up functioning almost as diary entries because of the lack of face-to-face judgment, but at the same time there’s more urgency than there might be with diary entries since Evie wants so much for Cilla to respond, and that desire is so palpable in the book. And that’s fun that you were able to be really playful in some ways even though, I’m sure, the format required you to be painstaking in other ways. Speaking of which, what was the biggest challenge in using the format you chose? Jen: For me, the biggest challenge was making sure that the letters fit with the calendar. During revisions, I had to make sure that letters “arrived” in a time that made sense with the post office, and that the dates on the letters matched the seasons and other holidays and school events. That was rather headache-inducing, to be sure! Yikes, that’s headache-inducing just thinking about that process! But I’m so glad you figured out all of those complicated logistics to bring Evie’s powerful story to life in this compelling way. Thanks so much for chatting with me, Jen! 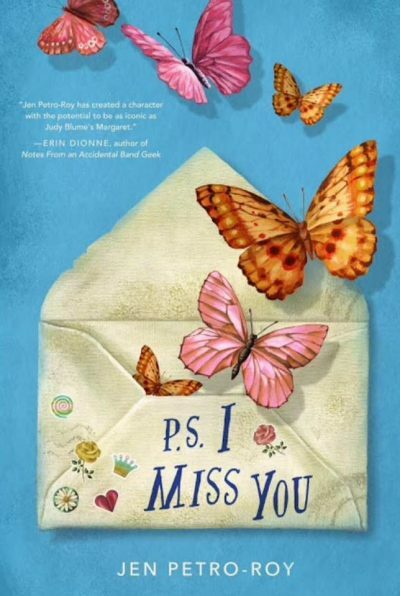 For fellow fans of epistolary novels, or heartfelt middle grade, funny middle grade, middle grade with LQBTQIA themes…I could go on…you can preorder P.S. I Miss You here, here, or here!